The Crystal Swan combines the elegance of a modern function venue with the uniqueness of a Swan River cruise. Offering full 360 degree panoramic views of the stunning Perth City skyline this designer vessel combines first class food and beverage services with guests being treated to an on-the-water vibrant cruising experience. 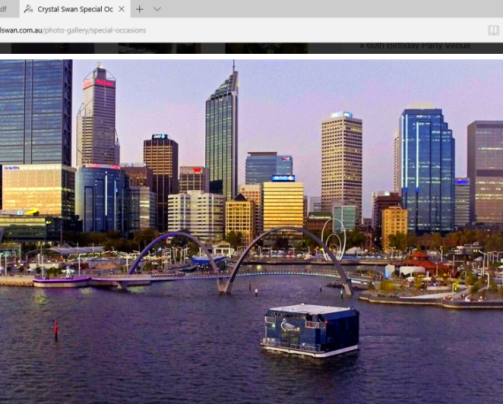 International exposure of the Crystal Swan showcases Perth on the world stage as a Tourism Icon with over 950,000 people visiting WA last year, with a large percentage of these visitors looking for activities at Elizabeth Quay and the Swan River. An on-board galley with fully qualified chefs offering a wide range of freshly prepared cuisines and a fully stocked bar on each of the two decks.